Why on earth would someone want to pack for 2 weeks in a carry-on? I would have asked the same thing until I did it myself. But on our trip to Portugal we did just that. We thought long and hard about making this decision and in the end I'm really glad we packed in a carry-on. We moved around so much on our trip and were often stuck for hours between hotels/Airbnbs- having anything bigger than a carry-on would have been a nightmare. Many times we had to carry our luggage up and down stairs too (think 4th floor walk-ups in Lisbon and down to the underground subway). But the biggest factor was cost. We flew on 8 planes and paying to check baggage on all those flights just wasn't an option. 1. Plan your outfits + stick to neutrals. This is an obvious tip, but we all know that towards the end of packing you just start throwing things in your suitcase. There is no room for this when all you have is a carry-on. If you have a beautiful top that you love but aren't exactly sure what pants it works with- don't take it. Make sure that each piece you have works with exactly what you have. It's a balancing act. The best thing to do is stick to all neutrals. (Or things that are easily interchangeable.) Almost everything I brought was black and that is the easiest way to go. I mean, you could bring all yellow things and it would be way better than bringing pieces in 10 different colors. 2. Only take 2 statement pieces. Having a statement piece like a floral or polka-dot top will make your wardrobe for the trip seem a little more lively. If you don't care about that, you can definitely bring 0 statement pieces. But just set yourself a limit. Casey and I knew we'd be taking photos of each other so we definitely wanted some piece of interest for that. 3. Take less than you think you need, and then take even less. If you are like us, you wear the same basic pieces. There's no need to think you will want to dress any differently when you travel. When you have all your outfits planned out, you probably could handle taking some things out. You need less that you think you do. I bought this really cute top specifically for our trip and I almost did not bring it. It required an undershirt and although it was thin and took up little space, I was on the fence of whether or not I thought I'd actually wear it. I chose to bring both pieces and guess what? I never wore it. A good rule of thumb- if you are ever on the fence about a piece, leave it at home. Bring minimal shoes. For our trip a stylish sneaker and our hiking boots could've worked for the whole trip. We did bring some nicer comfortable shoes though, and we used them a lot. Don't bother with heels or having a variety to choose from. A sneaker and a nice/comfortable shoe like this one will usually do the trick. And when it comes to makeup, only bring the necessities. There's something about traveling that makes you think you will want to wear or try new things when it comes to clothing and makeup. Every single time I travel I never wear half the makeup I bring. Bring the absolute bare necessities. We didn't wear any makeup for the last week of our trip because we were mainly exploring out in nature. 4. Leave (most) toiletries at home. Bring things that are not interchangeable like a travel size of your favorite dry shampoo. Leave things like shampoo and conditioner as your hotel will most likely have these. If you are really short on space, don't pack any toiletries at all. You can always buy these things when you get where you are going. 5. Use Space Saver Bags. These are a lifesaver for things like bulky sweaters and coats.You have to use these sparingly and wisely as they can become more of a pain if you don't have the right things for them. You don't want to stuff these bags full, just use them to condense a few things. 6. Wear your biggest item on the plane. This is pretty self-explanatory- If you are having to pack boots or a winter coat, save space by wearing those pieces. 7. Join forces and coordinate who is bringing what. This won't work if you are traveling solo, but if you are traveling with a friend, plan to share some things. Only one of you needs to bring a curling iron. Figure out who needs to bring what, but both of you don't need to bring 2 of a lot of things. Every little thing you can share counts. 8. Book a hotel or Airbnb that has a place to wash your clothes. 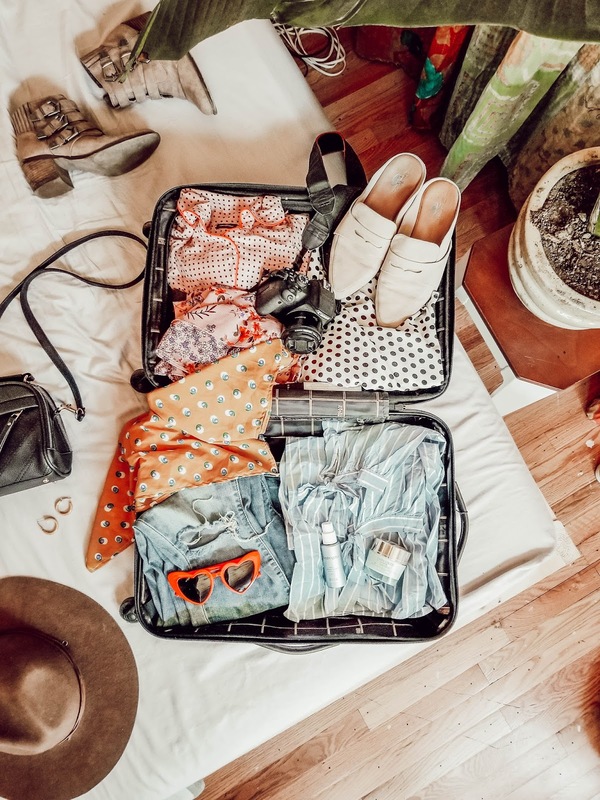 If you are traveling for 2 weeks, you are more than likely going to need to wash something- especially if you are trying to pack in a carry-on. If you can't stay in a place with a washing machine, then do like we did and hand wash your clothes. Whatever you do figure out a way to wash your clothes so you can bring half the amount of clothes you'd need for 2 weeks. Bring enough clothes for a week and wear them twice. 9. Utilize a backpack or purse in addition to your suitcase. On most planes you can bring two items- your suitcase and a personal item. This is usually how you carry your valuables like laptops and cameras. But you can also fit things like your makeup, laptop, and chargers in there. 10. Pack socks and underwear in nooks. If I'm traveling in a big suitcase, I like to keep things like underwear and socks all together in a packing cube. But there's no room for that in a carry-on. One packing cube takes up 1/4 of the suitcase. Roll these things up and stuff them into the little spaces that nothing else can fit in- like inside your shoes. 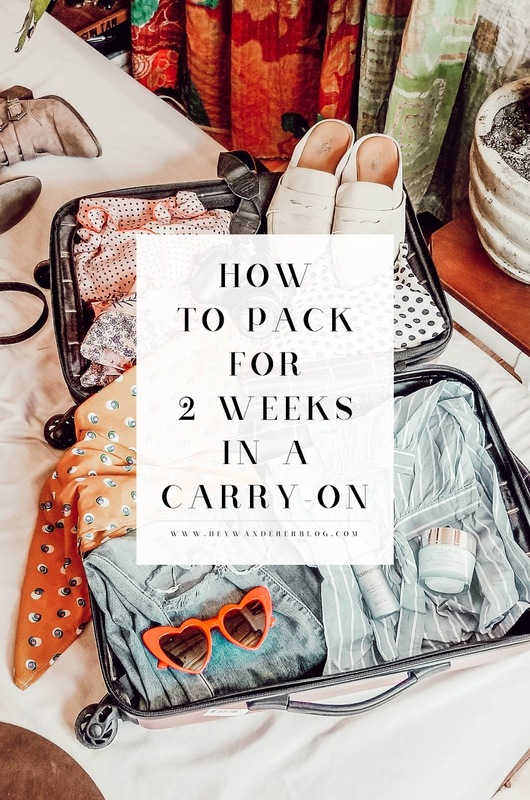 Most of these tips are great for packing in any sized suitcase! But if you are packing in a carry-on, you will want to strictly adhere to these. If you liked this post and would like to see more like it, please pin the image below on your Pinterest!